Name (Spanish) of a family known in the fourteenth century, and still flourishing in Turkey; it is probably derived from the former French district of Gatines. 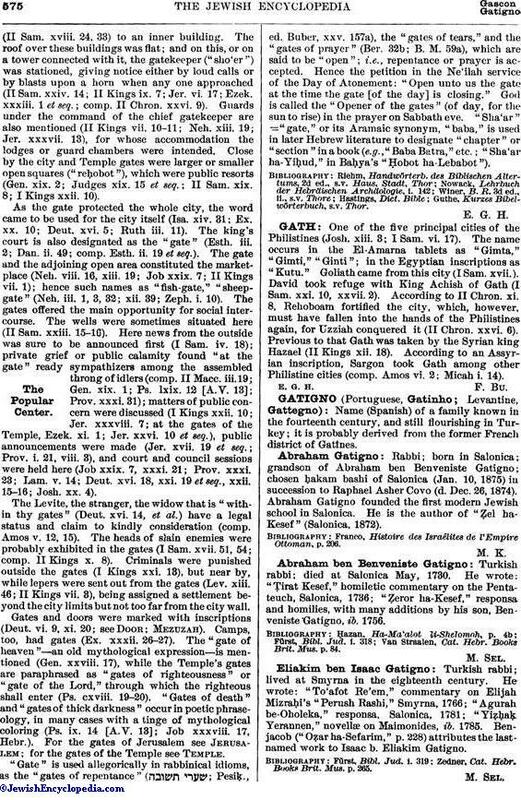 Rabbi; born in Salonica; grandson of Abraham ben Benveniste Gatigno; chosen ḥakam bashi of Salonica (Jan. 10, 1875) in succession to Raphael Asher Covo (d. Dec. 26, 1874). Abraham Gatigno founded the first modern Jewish school in Salonica. He is the author of "Ẓel ha-Kesef" (Salonica, 1872). Franco, Histoire des Israélites de l'Empire Ottoman, p. 206. Turkish rabbi; died at Salonica May, 1730. He wrote: "Ṭirat Kesef," homiletic commentary on the Pentateuch, Salonica, 1736; "Ẓeror ha-Kesef," responsa and homilies, with many additions by his son, Benveniste Gatigno, ib. 1756. Van Straalen, Cat. Hebr. Books Brit. Mus. p. 84. Turkish rabbi; lived at Smyrna in the eighteenth century. He wrote: "To'afot Re'em," commentary on Elijah Mizraḥi's "Perush Rashi," Smyrna, 1766; "Agurah be-Oholeka," responsa, Salonica, 1781; "Yiẓḥaḳ Yerannen," novellæ on Maimonides, ib. 1785. 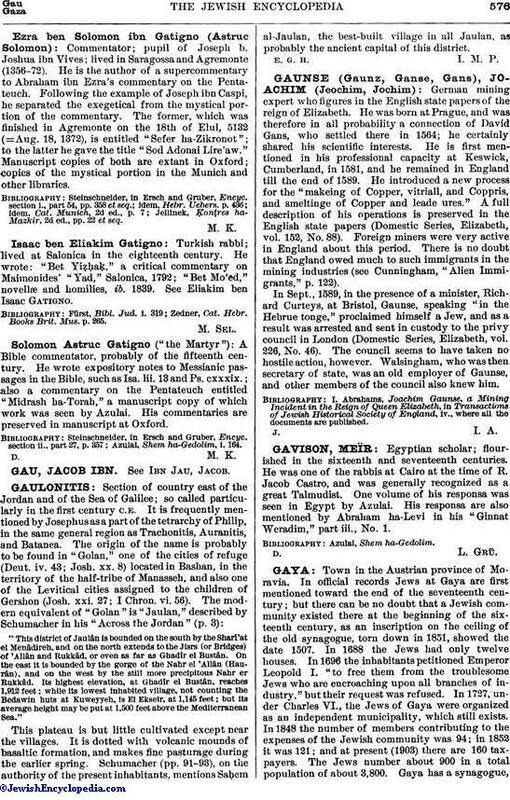 Benjacob ("Oẓar ha-Sefarim," p. 228) attributes the last-named work to Isaac b. Eliakim Gatigno. Zedner, Cat. Hebr-Books Brit. Mus. p. 265. Commentator; pupil of Joseph b. Joshua ibn Vives; lived in Saragossa and Agremonte (1356-72). He is the author of a supercommentary to Abraham ibn Ezra's commentary on the Pentateuch. Following the example of Joseph ibn Caspi, he separated the exegetical from the mystical portion of the commentary. The former, which was finished in Agremonte on the 18th of Elul, 5132 (=Aug. 18, 1372), is entitled "Sefer ha-Zikronot"; to the latter he gave the title "Sod Adonai Lire'aw." Manuscript copies of both are extant in Oxford; copies of the mystical portion in the Munich and other libraries. Jellinek, Ḳonṭres ha-Mazkir, 2d ed., pp. 22 et seq. Turkish rabbi; lived at Salonica in the eighteenth century. He wrote: "Bet Yiẓḥaḳ," a critical commentary on Maimonides' "Yad," Salonica, 1792; "Bet Mo'ed," novellæ and homilies, ib. 1839. See Eliakim ben Isaac Gatigno. Zedner, Cat. Hebr. Books Brit. Mus. p. 265. A Bible commentator, probably of the fifteenth century. He wrote expository notes to Messianic passages in the Bible, such as Isa. lii. 13 and Ps. cxxxix. ; also a commentary on the Pentateuch entitled "Midrash ha-Torah," a manuscript copy of which work was seen by Azulai. His commentaries are preserved in manuscript at Oxford. Azulai, Shem ha-Gedolim, i. 164.